Gabo is Sportydad's 13-year old kid. Like father like son, we're both hooked to sports, basketball especially. He knows his NBA. So I asked him to make his choices before the 2nd round of the playoffs. I am amazed by the depth of his analysis. Here's what he wrote (in his own words). Let's start in the Western Conference Match-ups 2nd round. OKC is the defending champions in the West while Memphis reached only 1st round after Clipper beat them in 7 games last year. Now I expected that the Clippers would advance but I was wrong. OKC will win in 6; Russell Westbrook is out for the OKC while Memphis lost their Rudy Gay during the regular season but the Thuders still have this young athletic forward namely, Kevin Durant. I think this will be a thriller match-up. GSW has a dominant young guard by the name of Stephen Curry, while the Spurs has their old big 3, Tim Duncan, Tony Parker and Manu Ginobili. I guess GSW will still dominate because not only Steph Curry is making points but his teammates also even if David Lee will miss this match-up because of an injury. Warriors in 7 even if it is in the home-court of the Spurs. Then let's move-on to the Eastern Conference Match-ups 2nd round. In this match-up, the Heat will win in 6 or 7 thriller games. Wthout D-Rose, the Bulls can still fight with their guard Nate Robinson and forward Luol Deng plus a great coach Tom Thibodeau. The Bulls will fight but they will be dropped as Lebron will be named the MVP of 2013 regular season and D-Wade as his side-kick. NYK will take this slow but sure, because I think the Pacers are still young for the Conference Finals but I know that they will reign but in their time. Knicks in 5 games, because of their dynamic duo Carmelo Anthony and J.R. Smith , the 6th man of the year. IND will still have this match-ups close because of their young scoring guard, Paul George and a unstoppable big-man in the paint, Roy Hibbert. My prediction is MIA-NYK. This will be a tough match-up, because both of the teams have their guard-forward duo, Lebron vs Melo and Smith vs D-Wade. Now I think the other players should shine like Chris Bosh in the Heat and Raymond Felton for New York. Miami will beat the New York Knicks in 7 close games. Both teams are offensive minded so expect high-scoring games. I predict that this will be a young team match-up. OKC-GSW, both teams are just new qualifiers in this Western Conference. With Westbrook missing this play-offs, Durant will still dominate because Durant has a scoring talent never seen before while GSW has a secret weapon, who is it? Its Stephen Curry. This young scoring machine is a player with quick release shot that is hard to guard. I predict though that OKC will beat them in 6 games. 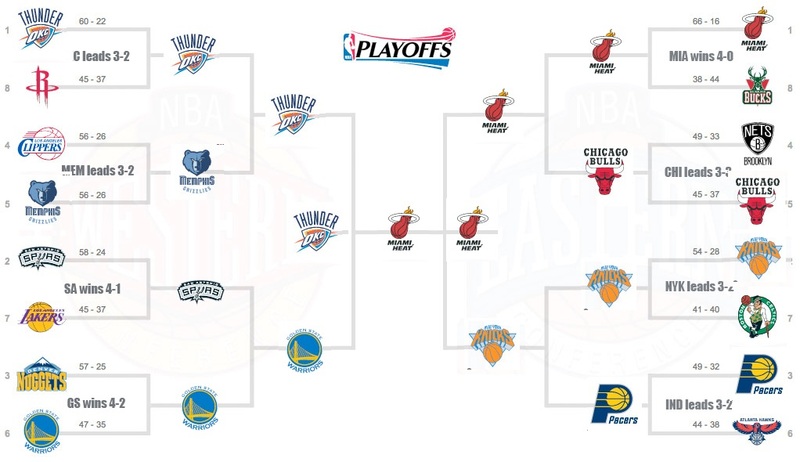 My prediction is OKC-MIA again. OKC will fight until the last game. Wesbrook is a big loss for the OKC and they are hoping for the return of their dominant guard. The MIA will win again in 5 games. Miami Heat will have this under control with Lebron and D-Wade plus a Chris Bosh in the paint . The Heat will still be the champions as the Lakers whom I chose to be in the finals at the start choked to the Spurs. You have captured it well, Gab. You should write more often about basketball. :) We're proud of you!